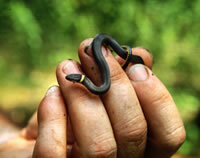 Named for a yellow band around the neck, the ringneck snake is relatively easy to identify when encountered. Its back is either slate gray, black or brown with smooth scales giving it a satin-like appearance. 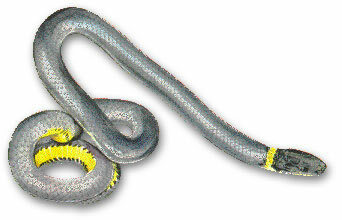 A complete yellow ring just behind the head, along with smooth scales, distinguishes it from redbelly or juvenile brown snakes. The belly is bright yellow or rarely orange, and may occasionally bear a few small black spots. Mating takes place in spring or fall, with 3-4 eggs (up to ten) laid in June or early July. Eggs are about 1" long and are deposited together under rocks or other cover, in rotting logs and stumps, mulch piles or small mammal burrows. Hatchlings emerge in August or September. 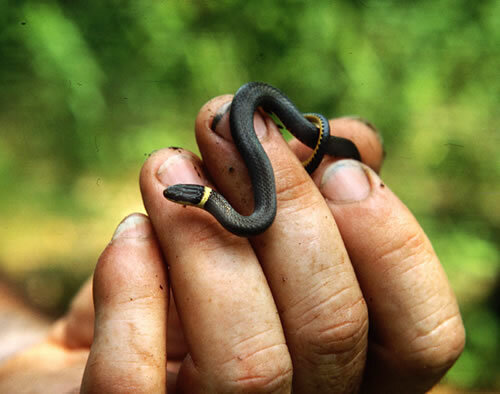 Ringneck snakes prefer moist woodlands as their habitat. This is also habitat for an important prey item, redback salamanders. Although salamanders make up the bulk of their diet, ringnecks will also feed on earthworms, insects and, on occasion, fish. As relatively small snakes, they rarely bask in the open and are generally found under cover (rocks, logs, boards, debris) during the day. Like the salamanders on which they prey, ringnecks are usually nocturnal. They are most active in spring and fall and are rarely seen during summer. 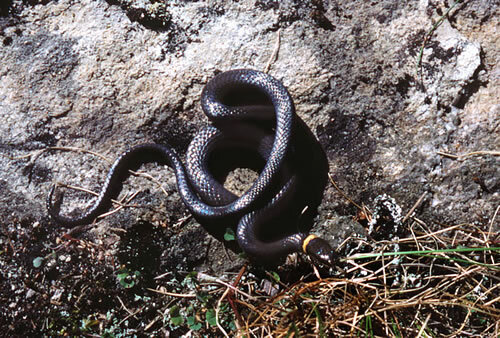 Among all the New England snakes, ringnecks are most likely to end up in someone's basement. 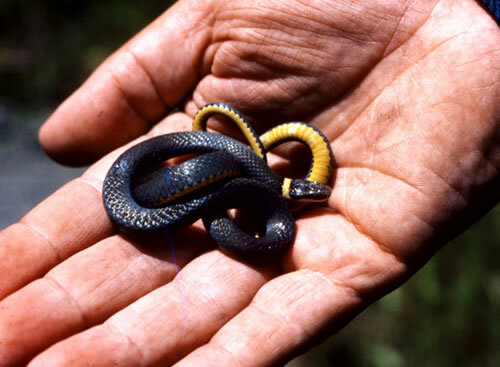 Ringneck snakes rarely bite, but may release a foul musk when handled.